Water adventures are thrilling, whether it is engaging in whitewater sports or speed racing. 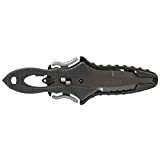 However, just as it is in many other sporting activities, sometimes you will find the need for rescue and that is why you need to buy yourself the NRS Pilot Knife. Every water adventurer should have a pilot knife because it is designed to save lives. There are many reasons why you should use this knife. One of them is that it is easy to draw out of its sheath, effortlessly. Again, there is a model for freshwater adventures and another one for saltwater adventures. You should never go kayaking without your safety knife. You never know when things might run into a snag. As an adventurer, you should never venture into the water without your knife. The NRP pilot knife is one of the best choices for many people. The NRS knife is very strong but not bulky. The handle is made of polypropylene that is enforced with glass and has a TRP over-mold. At the end of the handle is a glass breaking tip. That is a plus since many knives do not offer that. It is a welcome addition. This knife is ideal for canoeing. It has a long stainless steel blade with a partially serrated edge. This edge is for cutting rope. The knife’s sheath securely clips to the PFD lash tab. This is a unique sheath that will securely lock your knife in place so that it does not fall off even in vigorous water activity. It is only unlocked if you will squeeze both sides of the release. This design makes the sheath convenient for accessing and releasing your pilot knife when you urgently need it. This feature makes the NRS knife a very useful tool for the professional and recreational boaters. The Pilot Knife has a matte finish for orange, green and blue handle models while the black handle model has a PVD – Physical Vapor Deposition coating, which will not fade or peel away with a lot of use in the water. As you have seen in every NRS Pilot knife review, you will have noted that it is possible to strap it anywhere. You can strap it on any garment or even on the life jacket. You will worry that it might get out of your grip and plunge into the water. It has a rubberized grip to complement the contoured handle, therefore giving maximum control of its blade. Even without going deeper into the technicalities, you found the handle to be a soft but sturdy material even in water. It handles well when wet and when you wear gloves even if it is under the water surface. Everyone wants a knife that will handle well under wet conditions. You should be safe from the safety knife itself. A quick release is one of the most outstanding features of the pilot knife. When you are assured of no accidental release, you will not have a worry in your mind. It is rare for an accidental release to occur because the manufacturer somehow spring loaded the knife using clips that firmly secure it to its sheath. In case it happens, there is more precaution in the form of a blunt/flat point which safeguards against accidental punctures. Also, the quick release mechanism locks the knife back into the sheath with a snap. If you do not hear it snap, you should know it is not yet secure. The quick release mechanism is foolproof making it very useful when you have to react to any issue when on water. It is the reason why the NRS Pilot rescue river knife has an extra edge over other knives when you go for boating and rescue. The knife has a blunt safety tip that functions as a screwdriver. NRS Pilot Knife also has a dive tank wrench and an integrated bottle opener in its handle. As we said before in this review, use NRS Titanium Pilot Knife for saltwater kayaking to avoid corrosion. NRS designed its Pilot Knife with freshwater boating and rescue work in mind. You will find it extremely convenient in water. The edge has both serrated and smooth sections to help in cutting through a wide variety of objects, including wet rope. A rust-resistant coating is added to the NRS Knife blade in order to maintain its sharpness and shine for a long time. You can react quickly without risk of accidental puncture to the boat or injuring yourself because the stainless steel blade’s tip is blunt. You can use NRS Pilot knife for different functions. For instance, it is a very functional valve wrench for the oxygen tank. Therefore, it is a great accompaniment when you go for scuba diving. If you will dive into the salty water, carry Titanium Pilot Knife. You do not need to carry two knives. Just use the titanium knife for both fresh and saltwater kayaking. The handle of the pilot knife with a glass breaking tip at the end also includes a bottle opener. You can, therefore, use to open up all those frosty bottled liquids as you celebrate after your kayaking or canoeing adventure. You will discover that the blunt tip not only protects against unintentional punctures but it is also a flathead screwdriver. It is useful when you have to fix something when in water. NRS designed the pilot knife sheath using reinforced nylon to maintain the strength of its grip. The fiberglass sheath with reinforced nylon is exceptionally lightweight. Do not try to pull the NRS Pilot Knife from its sheath without using the release as that will be fruitless. The user-friendly release system will hold tight, so you have to follow the right procedure by squeezing the two sides of release. The NRS Knife is a sporting knife and every person who loves kayaking should have it. It is a one-off investment since it will last a long time. Whether you are a beginner or an advanced boater, it has suitable features for your boating experience. As you have seen in this NRS Pilot knife review, the knife is reliable and durable. It is worth buying for your personal safety and that of others. 4 Best Camping Bunk Bed Cots 2019. Reviews and Tips.